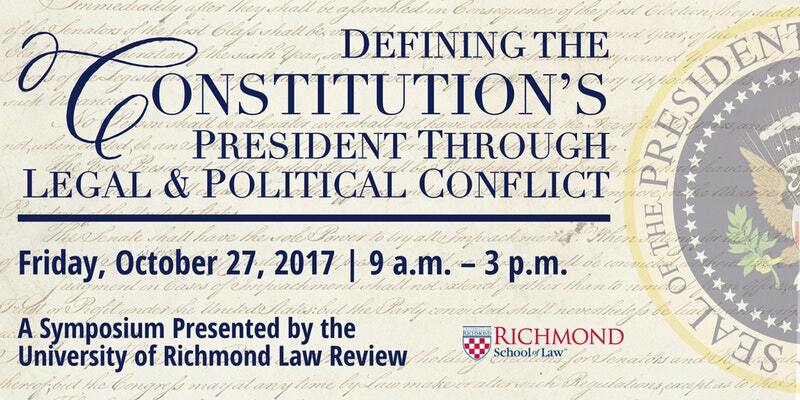 The University of Richmond Law Review presents a symposium on Defining the Constitution’s President Through Legal and Political Conflict, which will explore how the American presidency has been shaped by the Obama and Trump administrations through clashes with other branches of the federal government, as well as state attorneys general. 3 MCLE Credits Are Available to Attendees. Free Admission. Breakfast And Lunch Will Be Provided, with a Dessert Reception to Follow. Registration and breakfast will be available from 8:00 AM – 9:00 AM in the University of Richmond School of Law Atrium. Lunch will be served in the University of Richmond School of Law Atrium & Moody Plaza. The dessert reception will be held in the University of Richmond School of Law Atrium.